Wall decorations go back to the days when people lived in caves. There, on the stone walls, are the images of hands and animals. Mystical beings look out at us as artistic memories of that time and place. Although the Chinese were using decorated rice paper to embellish their walls for thousands of years, the story of wallpaper in Europe started with the use of beautiful tapestries that were hung to both bring beauty into the space and act as a form of insulation. Castles with stone walls were cold! This was a wall treatment that only the very wealthy could afford. From the pages of the “Dominion Pattern Book,” circa 1939. 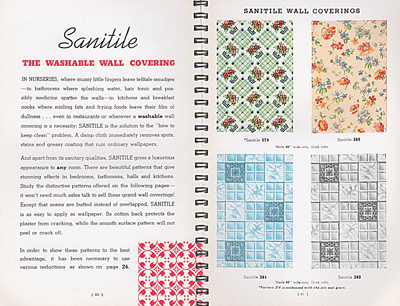 It was issued via the Dominion Oilcloth & Linoleum Company. By the time of the Renaissance, textiles were used to decorate walls, doorways, tables, and other interior surfaces. However, textiles was still out of reach for the majority of people. The idea of creating a printed paper as an inexpensive alternative emerged, and thus the concept of wallpaper was created. In England, the earliest documented wallpapers date from the 16th Century. Because they were trying to imitate fabric, the block-printed and hand-colored papers were reflective of the fabric patterns of the day. Designs were hand-carved into wooden blocks, one for each color. The design for each color block was pressed onto the paper in successive layers prior to its installation. Wallpaper has a very rich history of both color and design in Europe and America during the 17th and 18th Centuries. During the 19th Century, the Industrial Revolution brought technological changes to the wallpaper industry, changes that lowered costs through mechanization, thus making wallpaper much more popular and affordable. However, for the purposes of our discussion, we are going to look primarily at kitchen papers, ranging from the late Victorian era through the early 1950s. During the late Victorian era, kitchens of the wealthy generally did not have wallpaper, as the kitchen was considered a utilitarian space and was the province of the servants. These kitchens were generally at the back of the house or in the basement, and the walls were commonly either painted or tiled for sanitation. Guests were not brought into the kitchen. That would have been considered totally uncultured and uncouth at that time! However, in more modest homes where there were no servants, the woman of the house spent a lot of her time in the kitchen. These humble, more family oriented, kitchens were commonly papered with floral or geometric patterns, and the addition of the paper brought a touch of color into these areas. As time progressed, the Industrial Revolution made it increasingly challenging to keep domestic help. Those who would have previously had little choice but to work as domestics often chose to work in factories instead. Factory work was hard, but when their shift was finished, their time was their own. This demographic shift drew more women of various economic means into their own kitchens. By the 1920s, an increasing number of women were spending more time in the kitchen. And as the rural women of modest means had done before them, these women also began to bring color and papers into their kitchen environments. Tile had been closely associated with kitchens since the Sanitary Movement of the 19th Century. For those of more modest means, the plaster on the walls would sometimes be scored before it had fully set, to give the illusion of tile. Those scored plaster walls were then painted. The kitchen wallpapers of the 1920s, 30s, and even the 40s, often had stylized geometric elements in the design that was reminiscent of tile patterns. So even through the designs of the papers, there was a suggestion of tile in the kitchen. During the 1930s, kitchen wallpaper patterns became increasingly bright and creative. There were more scenes and kitchen related items, such as teapots, fruits, and flowers, incorporated into the paper designs. The popularity of kitchen wallpapers continued through the 1940s. Colors were bright and fun. The 1950s and 60s ushered in a more modern look to the papers, with geometrics shapes, boomerangs, and parabolas. Kitchen wallpaper can bring an element of charm to a period kitchen, charm that can’t be captured just through paint. There is a rich history of wallpaper in the kitchen, and perhaps today’s white and beige painted walls may once again make way for the colors and patterns of kitchen wallpaper. Be brave and try it! As for generations of women before you, wallpaper may bring some vibrancy into your kitchen. There are some resources for reproduction Modernist wallpapers. Bradbury and Bradbury have a Modernist line of kitchen wallpapers. Sanderson also carries a line of Modernist designs. 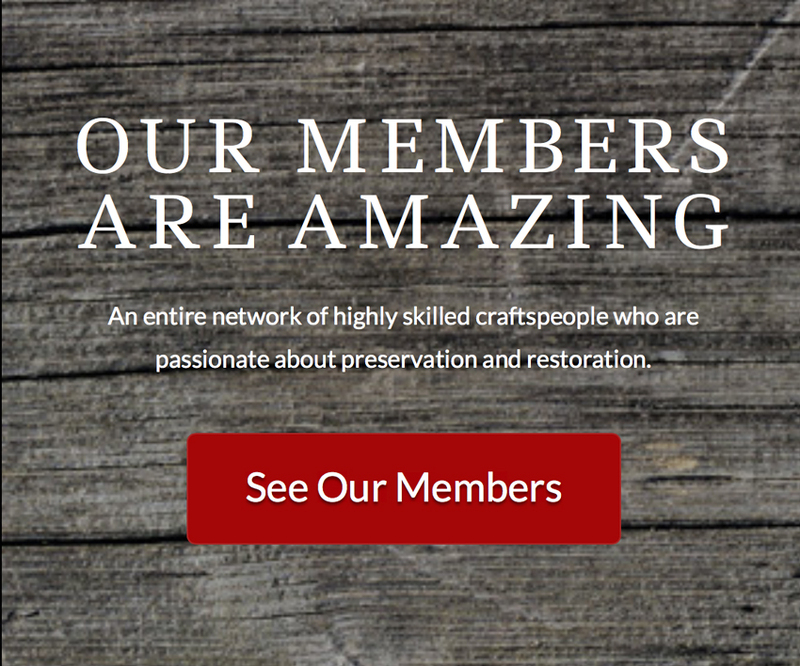 RetroRenovation has some words of wisdom to share about installing vintage wallpaper.